It's already autumn and the place is getting colder and colder. You thought the missions sent out to the headquarters will cease for the time being. However, it just keeps on coming. You rarely have time to talk to your friends since they're always out. You're in charge of the departures so you just remain in your office. But when the missions become too many to handle, you're also forced to vacate your position for a while to help. This is also a good change as you need to see the sun rising and setting once in a while. You can't choose where to go though. This privilege is only for those who had more than twenty missions. You only have been to three throughout your career here. So you just have to go to wherever your fate leads you. You step inside and wait for the right door to open up before you. Upon opening, you already feel the cold air rushing in. You want to close the door again but you see in the distance the little monkeys you need to collect. They seem to be teasing you but you'll round them up easily later. 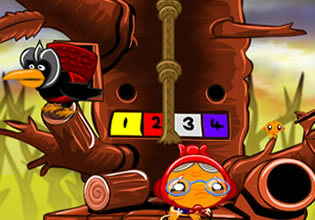 Play Monkey Go Happy - Stage 236 adventure game by Pencil Kids.